Matt Barrow And The All Nighters » MATT BARROW AND THE ALL NIGHTERS AT THE PIANO BAR!! 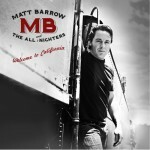 Home » Events » MATT BARROW AND THE ALL NIGHTERS AT THE PIANO BAR!! MATT BARROW AND THE ALL NIGHTERS AT THE PIANO BAR!! Its going to be a special night!! We are going to play a few songs from our upcoming new album!! Don’t miss it! !